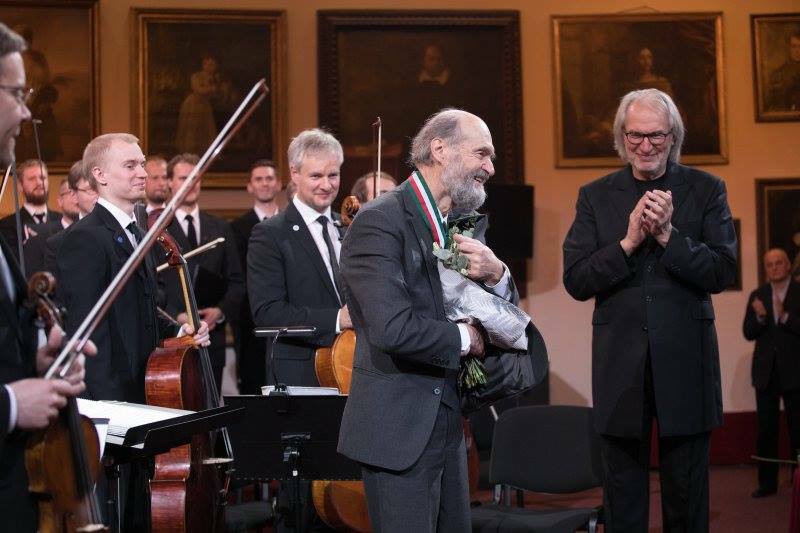 Then from Norway to Estonia, with a concert dedicated to the music of Arvo Pärt (pictured aboveby Danuta Matlock), and performed by his long-time advocates the Estonian Philharmonic Chamber Choir and Orchestra conducted by Tõnu Kaljuste. The concert was a mix of old favourites and newer works, the strings performing Fratres and Cantus in Memory of Benjamin Britten, before the choir joined for Adam’s Lament, Salve Regina and Te Deum. The strings played without vibrato, and although this highlighted some occasional intonation problems, it gave the orchestral sound a suitably ethereal quality. The Estonian Philharmonic Chamber Choir are so closely associated with Pärt’s music that it was little surprise to hear close to ideal performances from them, especially under Kaljuste’s engaged but unfussy direction. When the music began, it was fascinating to watch the composer. He listened with his eyesand a look of intense concentration on his face, often putting a finger to his lips, as if to urge even greater calm and inwardness from the ensemble. It is difficult to imagine how many hundreds of times he must have heard Fratres over the last 40 years, but it didn’t matter at all: he was living every note of it. Read more article on theartsdesk.